Pattern House Number and Name Stickers. Made Easy by Purlfrost. 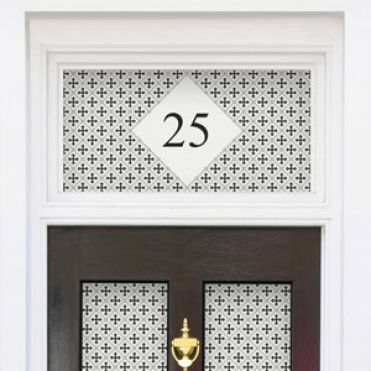 House number within a patterned background. These house number designs are created using a period or contemporary repeat pattern, and are ideal for a transom above a door, a window or a door itself. With our online design facility, you can order the film to your exact measurements and insert your very own house number. You can also order matching panels without a number if required.